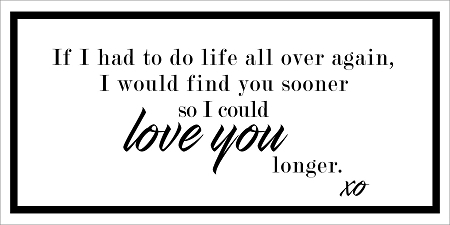 IF I HAD LIFE ... -PAINTSKIN - 11" x 22" CREATE A FABULOUS SIGN! NEED A BOARD? - See our tip below. Home > SHOP OUR PRODUCTS > 2019 PAINTskins FOR MAKERS - NEW! > NEW! PAINTskins > IF I HAD LIFE ... -PAINTSKIN - 11" x 22" CREATE A FABULOUS SIGN! NEED A BOARD? - See our tip below. So fun and easy to use with fabulous results! Peel it, place it and paint it; that's it! LOOKING FOR A BOARD? Our PAINTskins are the perfect fit for a standard 12" x 24" sign! Get a board at HOME DEPOT FOR $4.00; they'll even cut it for you! GIRLS NIGHT OUT? - (1) 1ft x 8ft length of board for $16.00 (tax in) will get you (4) sign boards. A great project for a gathering of girlfriends or a few extra DIY gifts for friends and family! BUY (2) or more PAINTSKINS and get FREE SHIPPING!